Dragon Quest XI, the new entry in the popular series currently in development for PlayStation 4, 3DS and Switch, is finally releasing this year, at least in Japan, and new details on the game are coming in quite frequently. Today, we finally learn more about the battle system thanks to the latest issue of Weekly Jump. 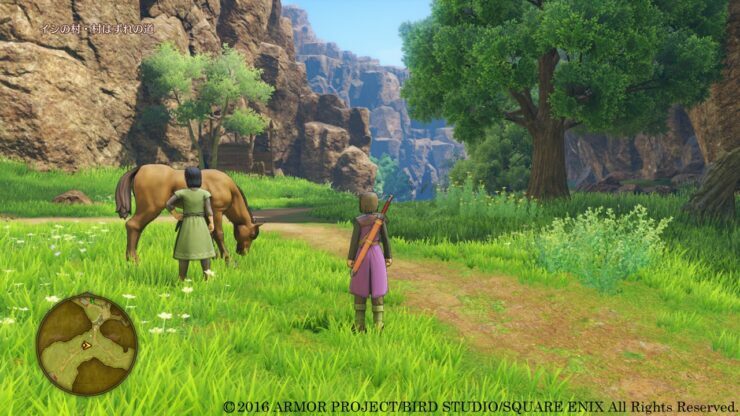 Both the PlayStation 4 and 3DS releases of Dragon Quest XI will sport a command-based battle system in the vein of previous entries in the series. The two versions of the game, however, will come with some differences: the PlayStation 4 release will use a Free Movement Battle system where players can freely move the character and camera, with an Auto Camera system allowing players to just focus on the battle; the 3DS version, on the other hand, will feature a 2D mode with pixel characters and a 3D mode, which looks not too different from the 3DS remakes of Dragon Quest VII and Dragon Quest VIII. Dragon Quest XI launches sometime next year in Japan on PlayStation 4 and 3DS, with the Switch version coming on a yet to be confirmed release date. The final release date for Japan will be announced on April 11th, while there is no info on a possible Western release. We will keep you updated on the matter as soon as an announcement comes in, so stay tuned for all the latest news.